Thundershirt uses gentle hugging to calm your dog or cat. 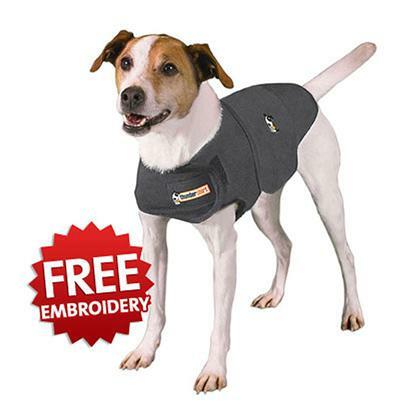 With its patented design, Thundershirt's gentle, constant pressure has a dramatic calming effect for most dogs and cats if they are anxious, fearful or overexcited. Based on surveys completed by over two thousand customers, over 80% of dogs and cats show significant improvement in symptoms when using Thundershirt. Thundershirt is already helping hundreds of thousands of dogs and cats around the world and is recommended by thousands of veterinarians and trainers. According to our research, dog thunderstorm anxiety or fear of noises can arise from a variety or combination of factors. Some dogs have suffered a traumatic event involving loud noises or lightning strikes that creates a historic "trigger" for them to become anxious. Some dog breeds may have a genetic predisposition towards noise anxiety while some studies suggest that storm or noise anxiety could be a result of aging or hearing loss. No matter the specific cause, the need to relieve your dog's fears becomes clear when your dog hides, shakes, or worse every time a storm rumbles.